The vast majority of aquaculture production in Scotland by both weight and value consists of the production of finfish in the sea, this being composed almost entirely of farmed Atlantic salmon. The salmon are moved into marine farms after spending the first year of their lives in freshwater hatcheries, tanks and cages, mimicking the natural life cycle of salmon in which the fish spend their early years in lochs and rivers before migrating to the sea. The marine farms where fish are grown are situated on the West and North Coasts of the Scottish mainland and in the Western Isles, Orkney and Shetland. They are normally positioned in sea lochs, voes and inlets where some shelter is provided from the worst of the weather. The farms in which fish are produced in marine waters typically consist of one or more groups of cages arranged in a grid pattern. These cages, also known as pens, are structures consisting of a floating circular or square ring on the surface of the sea supporting a large net bag hanging in the water. The floating rings are normally 90-110 metres in circumference with the net bags being 15-20 metres deep enclosing a volume of 10,000–15,000 cubic metres of water equivalent to approximately 20 swimming pools. The cages are anchored securely to the seabed using ropes, chains and heavy specialised anchors. The fish are held in the net bags which allow water to flow past the fish bringing fresh oxygen and carrying away waste products such as carbon dioxide and ammonia. Solid wastes such as faeces fall through the cage structure to the seabed under the influence of wind and tide. The fish are given food in the form of feed pellets and medicines can be administered if required either in the diet or by addition to the water within the cage. 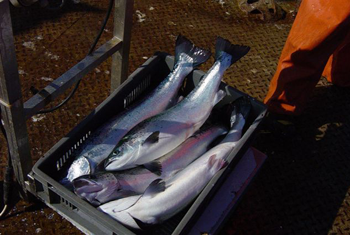 In addition to salmon production, small quantities of Rainbow Trout, Sea Trout and marine species such as Halibut, Cod and Haddock have been produced in recent years, the farming techniques and equipment being adapted to meet the differing requirements of each species.